Have you ever used Google Maps to explore a country or city? I use it when I'm looking up directions or feeling nostalgic about a place from my childhood - I'll zoom all the way into street view to get a close up look. Thomas and I have even used it to look up random places we dream of one day visiting. 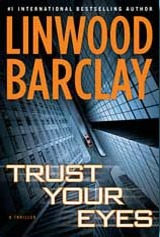 In Trust Your Eyes, Linwood Barclay has a character named Thomas Kilbride who uses Whirl360 (a fictionalized map website) to memorize the streets of every city in the world. While exploring New York City in street view, he looks up at a window and sees something that looks like a woman being murdered. This plunges Thomas, and his brother Ray, into a dangerous mystery. There are so many twisty pieces to this story, almost anything I say about it will give something away. So instead of telling you about the book, I'm going to tell you about my experience with it. I read Trust Your Eyes in one day, refusing to close it until I finished (hello peanut butter and jelly sandwiches for dinner). This was my first Barclay book, and I was impressed by the intricate puzzle he built - bringing in multiple characters, switching viewpoints, and weaving the seemingly unrelated pieces together into one complete story. He kept me guessing throughout the book. As I was reading it, I kept thinking it would make a good movie (the book trailer validated those thoughts, it is exactly how I imagined the book), so hopefully someone will jump on that soon. A note about the end of the book, specifically the very last page - I didn't love it. The final twist was something I saw coming, but I had hoped I would be proved wrong. Even with that disappointment, I liked the book as a whole, and enjoyed the story. Do you like books that keep you guessing all the way to the end? You can join in the conversation, and find our more about Trust Your Eyes at BlogHer. *Legal Stuff: This was a paid review for the BlogHer Book Club, and I was provided a copy of the book by BlogHer. The opinions expressed are my own, and I was not required to say nice things. i really need to read more often. i love books. I'll have to try this one. I've been pretty bad about stepping out of my favorite authors comfort zone lately, but this sound fun. Sadly, I do not like to read. Never has been a strong point in my life. Thank you for sharing though Tracie. Blessings. I love Google Maps. When I get homesick, I take a virtual tour of my old home town. It helps sometimes. Other times it makes the homesickness worse. :-( But, I still love to do it. thanks for the review! i'm always looking for books to read.